Dr. Krishna Kannan received his Ph.D. in 2004 and Masters in 2000 both from Texas A&M University in Mechanical Engineering. He worked for Thermax after his B.E. (from PSG College of Technology) for about an year. After his PhD, he continued in the same group with Prof. K. R. Rajagopal as a postdoctoral fellow. 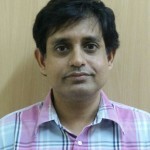 He joined IIT Madras as a faculty in the year 2006. His current research interests include Mechanics of filled elastomers, Thermodynamical frameworks for polymer crystallization and reacting systems, Constitutive modelling of viscoelastic materials, and Constitutive modelling of implicit materials. Dr. Henry Kahn Memorial Scholarship (1998).